The value of defining an architecture has often been questioned under the pressure of project deadlines and the immediate requirements of specific applications. When it comes to SOA, there is an additional challenge: many Enterprise Service Bus (ESB) vendors promote their products not just as a technology foundation, but also as the de facto architecture for their customers. So why do we need to define an architecture? 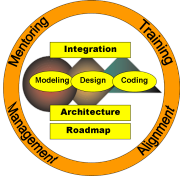 Our architecture practice can help you provide a clear rationale and cost / benefit analysis for building a vendor neutral logical architecture before embarking on the modeling, design and coding of your services.